Oh yes, please! 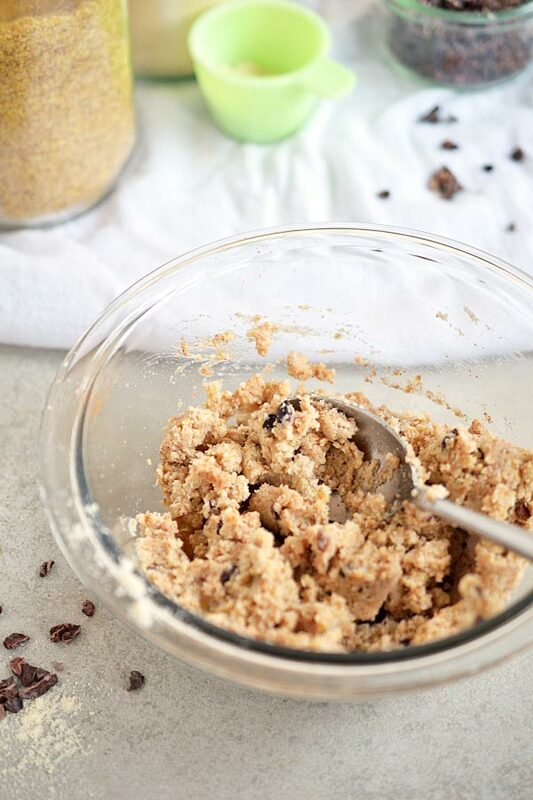 5-minute raw cookie dough that is healthy, fun, super easy to mix up, and so yummy! I think just about everyone has those memories of making cookies as a kid and sticking your finger in the dough or batter of cakes and cookies… but those were made with refined, white flour and sugar, and raw eggs. Not something I want to eat or anyone should be eating… Have no fear! 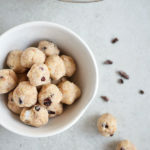 This recipe is egg-free, gluten-free, dairy-free, refined sugar-free, soy-free, vegan, and paleo. (yes, might as well just name everything! 😉 ) is here! More importantly, it’s packed with nutrients, healthy fats, and fiber! Coconut flour – I love using Nutiva’s flour! It makes for such a soft dough that is not grainy at all! 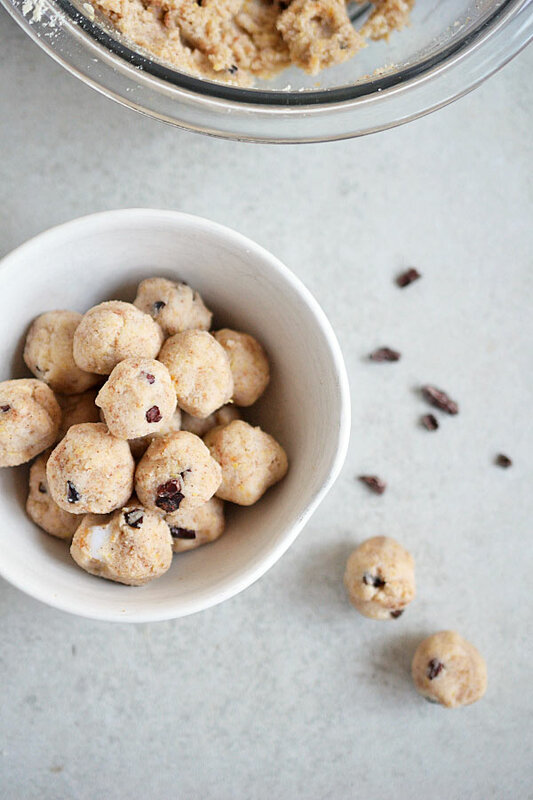 Mixed together with water until it sticks together, and you’ve got a super easy, fiber and nutrient-rich cookie dough! Mix coconut flour with about ¼ the amount of ground flax and/or chia. I generally begin with about 1 cup of coconut flour and then go from there. The flax and chia is what helps bind the dough together, while adding lots of great nutrients and texture. Drizzle in coconut butter or oil, about ¼ the amount of flour used. This helps firm up the dough when chilled. Add desired amount of cinnamon and a pinch of salt. Add enough water to the date paste to make thinner, more like a syrup. 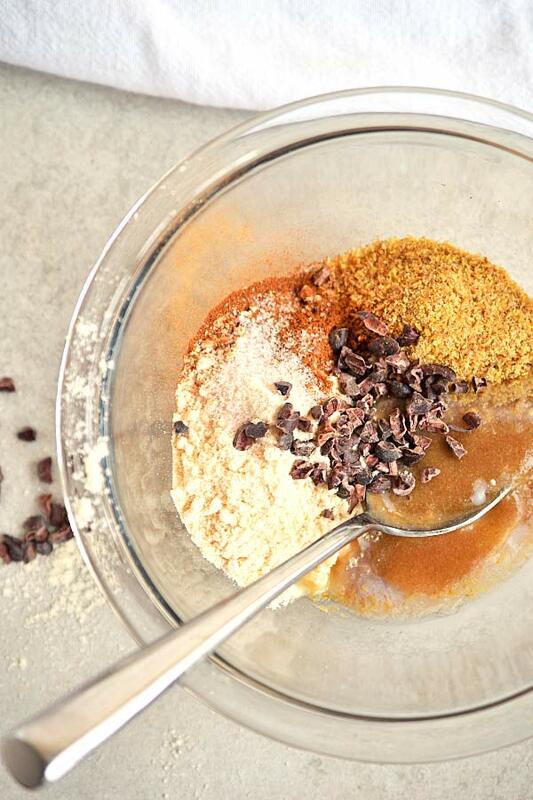 Begin adding this date "syrup" to the mixture until it easily sticks together. Test your dough by pressing a handful between your fingers. If it falls apart, add more syrup or water. If it sticks together well, it's perfect. Taste it and see if it needs a bit more date paste or cinnamon. Add more if needed, and mix in cacao nibs if desired. Leave as is or roll into cookie dough balls to be used in recipes. Enjoy!